Here are some fun and inexpensive preschool math activities. I believed in using fun hands-on projects when I was homeschooling young children. Preschoolers have a lot to learn before they become good at math. They need to be able to compare and describe items according to size and shape. Children need to be able to see patterns. They need to understand about different amounts. Here are some hands-on activities that I did with my children. 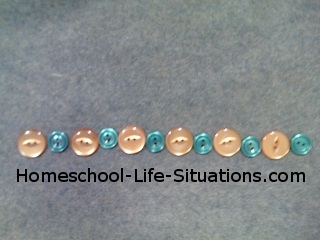 Learning about patterns is an important preschool math activity. It helps children understand similarities and differences. Patterns can be auditory or visual. Identifying patterns is the first learning step. Our child might see that his shirt has a red and blue stripe pattern. He then might match a necklace that has the same red / blue sequence. Here are some simple pattern activities that you can do with your child. Point out the stripe pattern on your child’s shirt. To teach your child about auditory patterns make up hand clapping rhythms. Have your child repeat the rhythms. Preschool math activities can include geometry. Your preschooler can learn basic shapes. When my children were young I had a vinyl picture book that had simple shapes. We would read the book together. We also had cookie cutters in different shapes. I had a doughnut cutter that made circles and a Christmas cutter in the shape of a star. If you do not have a doughnut cutter you can use a clean bottle cap to make circle shapes. For triangles and squares you can cut out shapes from cardboard. Give your child a plastic knife to cut around the shape. You can also make shapes out of sponges or craft foam. If you make two or more of each shape you child can match the shapes together. You can also make big, small, and medium shapes to show size. My children liked to play with pattern blocks. Even at a young age they learned how the blocks fit together and made pretty designs. Another idea is to cut out paper shapes. 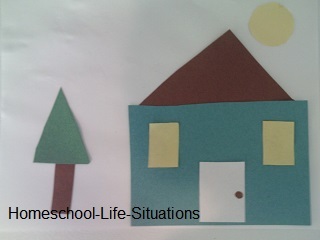 Have your child make pictures with the shapes. A rectangle and circles can make a car. Squares and triangles can make a house. Make Christmas trees from triangles and a small rectangle. Other type of trees can be made from circles and rectangles. Even young children can do graphing especially when you use real items or pictures. A four year-old can sort like items together. 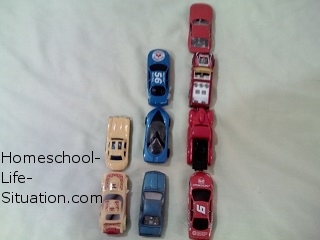 We can then say "lets line the items up to see if we have more red cars or blue." Here is a list of real items your child can graph. Use the kitchen table or the floor to line your items up on. Graphing teaches children to sort and see relationships, learn about more and less, and they can practice their counting. Each day we would check the weather and place a picture in the appropriate line on a piece of paper. You could also use stickers. Show your child how to line up ten gold stars. Next have him line up seven blue stars. Then you could ask him which row had the most stars. The kitchen is a great place to do preschool math activities. At lunch you can cut an apple in half to share. You could also cut the sandwich into either half, fourths, or thirds. I also made simple recipes with my children. They can help measure the ingredients. I have even seen some recipes where the ingredients were in pictures. Here are some more preschool math activities to teach different math concepts. Teach your child to measure. You can use nonstandard measuring tools. Have your child count his steps when he walks across the living room floor. Another idea is to use blocks to measure a table or linking cubes to measure a book. Your young child can learn a lot about time by being on a schedule. When you wake your child say something like, “It is 9:00 time to get up.” As you go through the day mention what you do at certain times. Also talk about what you do when it is daytime and what you do at night. It took my child several more years before he could read an analog clock. We really did not start teaching how to read a clock until kindergarten or first grade. Preschool children can also learn about money. Start out by counting pennies. Teach him to count by ten with dimes. When he can count pennies and dimes well teach him to count by five with nickels. Take your child to the store so that he can begin to understand that money buys things. If at all possible use cash to make your purchase. Another way to teach about money is to play store. Place a price tag on toys or other small items. Place a monetary amount onto the tag. Give your child some money. Let him buy items in the store. I hope that you have found some preschool math activities that will help you teach your child.